MAKE SURE YOU HAVE POPUP BLOCKERS DISABLED BEFORE USING THE ONLINE DOWNLOAD! This map is designed to run at a peak of 20.5psi, but is tuned up to 21.5psi. 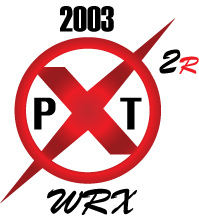 It is not recommended to run any more than 21psi with the stock WRX turbo on low octane fuel. The A/F for this map runs mid-low 11's in the mid-range and 10.7 to 10.9 towards redline..
GM Boost Solenoid is NOT included. This is for an ECU Map only.